Herod had "stretched forth his hands to vex certain of the church" (Acts 12: 1). He killed James the brother of John with the sword (12:2) and put Peter in prison during the passover. He put 16 soldiers to guard him and intended to kill him after Easter. The church prayed "without ceasing" for him (12:5). On the night before Easter an angel appeared to Peter and broke the chains off his hands and ordered him to put on his clothes and follow him out of the prison. 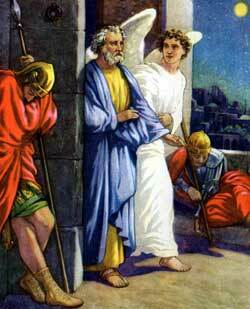 Peter passed safely by the two guards who were sleeping next to him and the 14 guards guarding his cell. The angel left him when he entered the street and then Peter went to the house of Mary the mother of John, surname Mark (12:6-12). Peter told them how the Lord delivered him out of prison and commanded them to "shew these things unto James, and the brethren" and then he departed. one can only imagine her joy at finding Peter at the gate. It is probable that only moments before she had been praying to God to free and protect Peter, when all of a sudden she heard a knock and there was the very prophet she had been praying for. Who knows, it could have been an instantaneous response to her prayer! perhaps Peter came to Mary's house especially because of the prayers of this young woman. In 12:12 it says that "And when he considered the thing, he came to the house of Mary the mother of John." He doesn't stay long, only long enough to tell them their prayers had been answered. Part of me believes that he came specifically to answer the prayer of a little girl who prayed with perfect faith. the gate” (Acts 12:14)—leaving the prophet of the Lord, who only moments before had prison gates opened for him by angels, cooling his heels outside. " Not only do I love her excitement and energy, but I admire her tenacity. She stuck firm to what she knew to be true, even when others were mocking her and criticizing her. She didn't back down and she didn't deny what she had heard. She knew the voice of the prophet and she could not and would not deny it. Her story helps remind me about how exciting it is to hear the voice of the prophet, and how that excitement should make me want to share it with everyone, even at the expense of being criticized. What amazing integrity and strength for so young a woman! Oh, she is also mentioned in this wonderful talk by Prophet Spencer W. Kimball. It thrills me that prophets of God are aware of and impressed by the stories of the young women in the scriptures! Have you ever had a time in your life when people thought you were crazy because of your beliefs? What did you do? Why is it so hard to stand up for what you know to be true? How do you imagine the rest of her life was changed by this experience? Do you think she ever doubted God would answer her prayers? Why do you suppose she didn't open the gate and left the prophet standing outside? Why has no one painted a picture of Rhoda (at least not that I can find)? This is a MAJOR oversight in my opinon! This story leads me to think about the prophet. Would I be as overjoyed as this young woman to be near the prophet and to hear his voice. If I am, do I hearken unto what he says? It's one thing to be excited about General Conference and hearing the prophets, but another to apply their teachings in our lives and write them in our hearts. Also, I love that she knows the prophet's voice. I remember having a leader ask if I would recognize the prophet or another Church leader if I heard them on the radio. It's kind of a fun game to see if you can identify the speaker.